The complex landscape of the scientific institutions operating at the international level in the post-World War II period is outlined here. 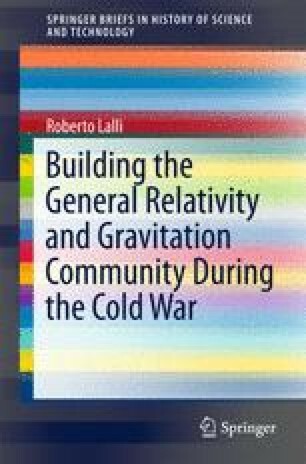 Around the mid-1950s, when the community-building activities connected to general relativity first began, a reconfiguration of these institutions for the promotion and organization of international cooperation in science was under way. The motivations for, and constraints of, this transformation were defined by the world order that was being constructed after the end of World War II and by the evolution of the Cold War. For those willing to create a new structure for promoting general relativity in the international arena, these existing institutions provided both a model to follow and a larger established structure with which to interact. It is argued that one of the major structural changes in institutions such as the International Unions was that they began promoting specific areas of research at this point, while before World War II their role was limited to define international standards. Besides these structural changes in scientific institutions, the second major element was the changing political context related to the post-Stalinist reforms in the Soviet Union and the related détente in international relations that led to an increasing participation of Soviet scientists in international scientific institutions. Anon. 1992. UIPPA-IUPAP 1922–1992. Album souvenir realized in Quebec by the Secretariat of IUPAP. http://iupap.org/wp-content/uploads/2013/04/history.pdf. Accessed 7 Mar 2016. Crawford, Elisabeth, Terry Shinn, and Sverker Sörlin. 1993. The nationalization and denationalization of the sciences: An introductory essay. In Denationalizing Science, ed. Elisabeth Crawford, Terry Shinn, and Sverker Sörlin, 1–42. Dordrecht: Springer. doi: 10.1007/978-94-017-1221-7_1. Hollings, Christopher D. 2016. Scientific communication across the Iron Curtain. Cham: Springer International Publishing. doi: 10.1007/978-3-319-25346-6. Wang, Zuoyue. 1999. U.S.-China scientific exchange: A case study of state-sponsored scientific internationalism during the Cold War and beyond. Historical Studies in the Physical and Biological Sciences 30: 249–277. doi: 10.2307/27757826.